EXPECT THE UNEXPECTED—Margaret Carlson stands next to Eleanor Roosevelt’s jade tree in the kids’ room of Bay Leaf Books. The beauty of a used and rare book store is the unexpected items that can be found within, changing from week to week and with each buyer and seller of the unusual treasure. At Bay Leaf Used and Rare Books in Sand Lake, shoppers can explore to find a piece of the Congo in a collection of fossils and stones, the aching beauty of an Atlas moth mounted on parchment, or perhaps a used book that brings back forgotten childhood memories or triggers other emotions. The fun is in the finding, and sometimes never knowing how this book, that fossil, or piece of ephemera came to land there on the shelf. Each has a mystery and a story behind its continued journey—something never found in the shipped, prepackaged goods sold in our country’s millions of big box stores. In a sunny spot in the children’s room, a smallish jade tree sits unassumingly in its porcelain pot. Those browsing by may not realize their close brush with history. The jade is in the care of Margaret Carlson, but it began its leafy life far from Sand Lake. Typical of the eclectic items found in such places as used book stores and other shops where items find a new life, the jade has an interesting story behind it. Carlson said it was over 40 years ago when she was living in Mahwah, N.J. when she saw an ad in the New York Times about a sale at the cottage of former First Lady Eleanor Roosevelt. The cottage, Fal-Kill, near Hyde Park, N.Y., wasn’t far from Carlson’s own home. A great fan of Eleanor Roosevelt, Carlson said she couldn’t resist going to the sale to see the home of the woman for whom she had such admiration. Anna Eleanor Roosevelt was born on October 11, 1884 and died November 7, 1962. She was the First Lady of the United States from 1933 to 1945. She supported the New Deal policies of her husband, distant cousin Franklin Delano Roosevelt, and became an advocate for civil rights. After her husband’s death in 1945, Roosevelt continued to be an international author, speaker, politician and activist for the New Deal coalition. She worked to enhance the status of working women, although she opposed the Equal Rights Amendment because she believed it would adversely affect women. Carlson was not disappointed with her visit, but didn’t expect to end up with a living connection to the great Eleanor that would be with her over the next four decades and longer. On impulse, Carlson picked up the branch and kept it, rather than leaving it to be thrown away. 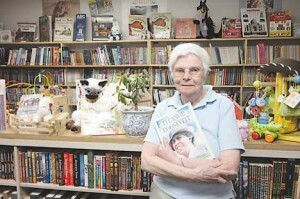 Carlson and her husband, John, are avid readers, active volunteers, and world travelers. They had been making weekly trips to Sand Lake to have lunch at the Lakeside Restaurant and visit their friends at Bay Leaf Books and Bargains Galore. 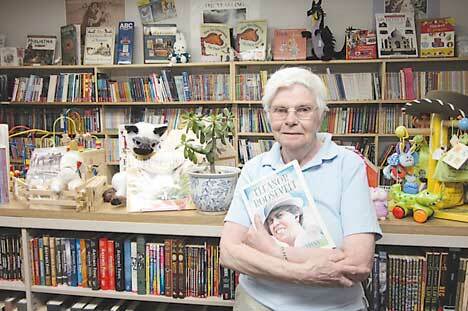 “On our weekly visit to Bay Leaf Books in Sand Lake, I told the story,” she said. Bay Leaf Used and Rare Book store owner Gabe Konrád was immediately interested and Carlson brought him a plant grown from a clipping of the same Eleanor Roosevelt jade. The plant did well and today thrives in a sunny window.